Looking for a beautiful wood fence that will make everyone happy? Consider our shadow box fence. Also known as a good neighbor fence, this type of fence delivers attractive views for both you and your neighbors. Because both sides look the same, a shadow box fence can help improve your relationship with your neighbors. 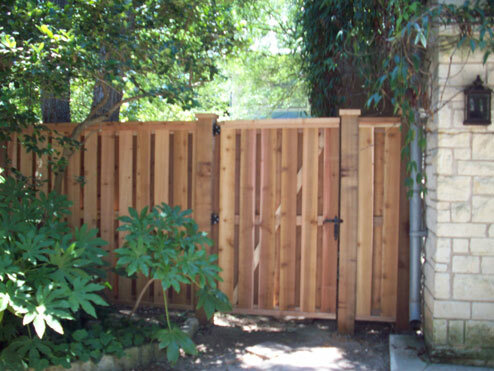 When you opt for the shadow box fence, you’re not just choosing a plain wooden fence. You’re creating a fence that can not only help you achieve the privacy you’re craving but can also help to build a bridge between you and your neighbors. Rather than just simply thinking about your own yard, the fence provides a good option for everyone involved. Unlike a standard wooden privacy fence with only one attractive side, shadow box fences are aesthetically appealing on both sides. Instead of having one side of the fence contain all of the structural components, our shadow box fence panels have staggered fence pickets. The spacing between the pickets allows air to easily pass through but maintains privacy because the gaps are covered by alternating pickets. These alternating pickets hide the fence’s structural elements while maintaining a clean and finished look both you and your neighbors will love. In addition to their aesthetic appeal, shadow box fence panels are also known for their strength. Because of their staggered nature, shadow box fences are able to withstand heavy winds and severe weather events. The staggered design also allows air to flow freely, which can help gardeners with their crop production. Once you’ve settled on a shadow box fence for your Austin home, you’ll want to decide whether you want a standard shadow box fence or a customized version that better suits your home and neighborhood. You may opt for a lattice top, which offers a smooth, straight line over a woven pattern with varying section heights. Or you might lean towards a convex design, which trades the straight edge for curves, creating the illusion of waves. You might also choose to use gothic posts to offer an elegant pointed arch to your fence. Whatever your vision, Apple Fence Company can help install a shadow box fence that suits your wants and needs. If you’re interested in a shadow box fence for your Austin or Leander home, contact Apple Fence Company. Our fence contractors have over a decade of experience installing shadow box fences in the Central Texas area.